In 1529, Martin Luther wrote his small catechism. It was a simple edition that included among its subjects the Ten Commandments, Apostles’ Creed, The Lord’s Prayer, other prayers including one for grace at the table, and some additional important topics for Christians. In his preface, Luther said that he wrote the catechism because during a visitation of churches in area towns he found that the people knew “nothing about Christian doctrine” and even some of the pastors were “quite unfit and incompetent to teach.” He encouraged ministers to use the catechism to teach adults but “especially … the young.” Luther’s catechism provided a concise and simple way to bring reform to a considerable portion of the people. The doctrine in Luther’s catechism is not in full agreement with that of Presbyterians today, so it is not the best source for teaching their children. In the Presbyterian Church in America (P.C.A. ), the catechisms composed by the Westminster Assembly provide essential truths. However, Luther’s catechism is historically important because it provided basic instruction for the people, and it was the first catechism written by a married former Catholic priest who had children that could learn from its teaching. The central figure for the doctrine of Presbyterian and Reformed churches is John Calvin. He published his first catechism in the French language in 1537 for local use by the churches in Geneva. It included brief summaries of important doctrines, short commentaries on the Apostles’ Creed and Lord’s Prayer, and some instruction regarding pastors and the ministry of the church, but it did not use the question and answer format. By 1545 his catechism had been lengthened considerably with its method of presentation changed to present Bible truth with 373 questions and answers. The question and answer method he used is like a scripted conversation between a master and a student; some questions are answered with a simple “yes” or “no,” but in other cases, the answers constitute a paragraph. The conversational form of the catechism was designed to make it easier for the student to remember doctrinal truths. Even though the Reformation emphasized that Scripture, teaching, and worship should be in the common languages of the people, Calvin published the 1545 edition in Latin so ministers and teachers in Germany, England, Spain, France, and other countries could read it and then translate it into their own tongues. 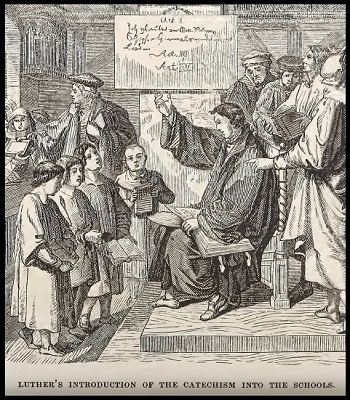 Catechisms during the Reformation were especially helpful for teaching a predominantly non-literate population the basics of the faith through the use of questions and answers. However, even though a lack of literacy—depending on how one defines literacy—is not a great problem today, catechisms continue to provide essentials of the faith and key points of doctrine. Just as a lighthouse assists a helmsman navigating a ship through hazardous seas, so a catechism guides a Christian’s thinking about God and his plan of salvation through the rough waters of false teaching. Twenty-first century Christians face a barrage of teachers through television, movies, social media, and web sites, so it is important to have a standard for guidance such as catechisms and confessions that provide summaries of what the Bible has to say about key doctrines. The Apostle Paul has reminded God’s people to “no longer be children, tossed to and fro by the waves and carried about by every wind of doctrine, by human cunning, by craftiness in deceitful schemes” (Eph. 4:14). The use of catechisms can guide twenty-first-century Christians as surely as it did during the Reformation, besides, the brevity of catechism questions makes for edifying reading on a smart phone while waiting for your car to be serviced.